Adair Turturro was born in Albany, Georgia and grew up in Rome, Georgia. She graduated from Kennesaw State University with a Bachelor of Business Administration in Accounting. Several years after working for an outpatient pediatric rehab clinic, she decided to pursue a new career path as an Occupational Therapist. She put her MBA on hold and graduated in 2015 with her Master of Science in Occupational Therapy at Brenau University. During her time at Brenau, Adair had the opportunity to study in Mexico to learn about it’s healthcare system. She was also a part of a master’s research team studying the effects of electronic auditory stimulation effect, a listening program, on children with auditory processing difficulties. 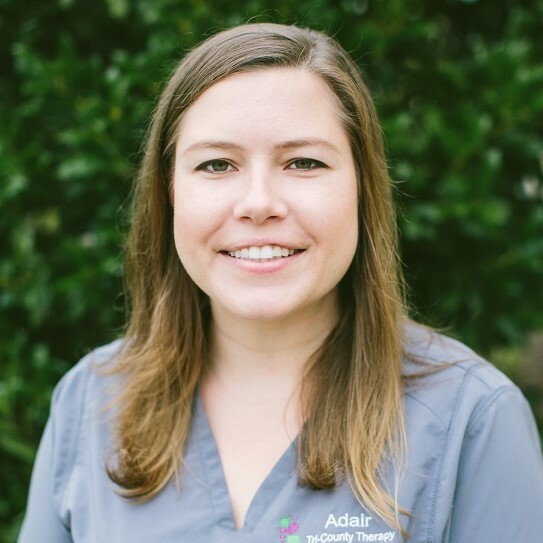 Adair enjoys traveling, sailing, spending time with family, exploring Charleston with her husband, Nick, and going to the beach with her three dogs, Dottie, Axle, and Elvis.